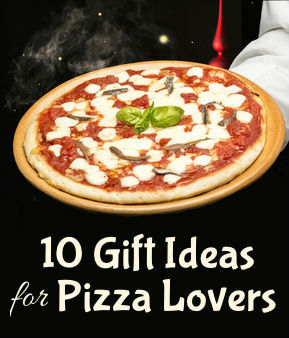 10 Gift Ideas for Pizza Lovers | Eat This! There’s nothing a slice of holiday pie. Pizza pie, that is. The cheesy, saucy, topping covered majesty of pizza is alluring to almost everyone, but some people have made pizza a lifestyle. They enjoy breakfast pizza with eggs and bacon, deconstructed trendy post modern restaurant pizza served cold and upside down and even consider after dinner dessert pizza to be a tasty treat. No other food on the planet inspires such fanaticism and variety. Here’s a list of gifts for pizza lovers to make your favorite pizza pie lover respond with a million grazie. If you want to see your pizza lover’s face light up on Christmas morning then the Presto 03430 Pizzazz Pizza Oven is a slam dunk. It is very well reviewed on Amazon and costs a small fraction of other dedicated pizza ovens while using just 60% of the energy of a conventional oven with no extra time for preheating. It has plenty of clearance for adding toppings unlike the ovens with closing lids. It also makes superb wings and nachos as well. The Presto 03430 Pizzazz Pizza Oven features two separate heating elements with individual controls to evenly heat pizzas either frozen or fresh. The machine rotates the pizza while it cooks which helps you to get consistent results each time and the pie will be cool enough to eat before a regular oven would be hot enough to cook. It’s pizza time and the pie is ready but you don’t want to dirty both a knife or a cutting wheel and a spatula that will mangle your perfect pizza. Then you remember that a very thoughtful person gave you the Dreamfarm Scizza 12-Inch Pizza Scissors and, voila!, problem solved. These scissors are nearly indispensable once you realize how convenient it is to have both a cutting and serving utensil in one. No more dangling cheese and partially cut toppings and the Dreamfarm Scizza 12-Inch Pizza Scissors have a non-stick safe nylon base which won’t scratch expensive pizza stones or pans. Just give it a couple snips and then lightly grab the cut piece and it’s ready for the plate. When you’re camping in the great outdoors it’s easy to get tired of burgers and hotdogs ( or veggie burgers and veggie dogs). Now with the Cuisinart Pre-Seasoned Cast Iron Grilled Pizza Set you have everything you’ll need to make delicious pizzas a barbeque standard. If you are a fan of the backyard BBQ, this set allows you to get pizza oven results without spending hundreds or thousands of dollars on a pizza oven. The taste of flame grilled pizza might even have you trekking out to the grill over a perfectly good oven when your at home. There are less expensive options which utilize a non-stick coating and a less durable pan but this cast iron set up won’t leave bits of toxic coating stuck to your food and the pan is actually pre-seasoned to provide some natural non-stick coating. The set is also a good deal when you consider that it comes with a serving pan and an attractive bamboo pizza peel for moving the pie while it’s on the grill. The foundation of every amazing pizza is, of course, the crust. For the gluten free pizza lovers on your list who may be missing out on pizza due to their dietary restrictions, the Gluten Free Pizza Kit will allow them to enjoy a gluten-free version of the food they love. The Gluten Free Pizza Kit is certified organic, vegan and oh-so-good. It’s ready in just 30 minutes and the kit includes sauce and cooking paper so all you need is an oven and your favorite toppings. There’s no need to spend a ton of money to get a great pizza crust that doesn’t rise too much. Just roll the Ateco Dough Docker over the dough and your crust will be as thin and crispy as you want it to be. The high impact plastic design is built to last but allows the tool to be sensibly priced enough to give to your favorite pizza lovers. No more endless poking with a fork to avoid a crust that rises too high and the Ateco Dough Docker is useful for plenty of other baking applications as well. One of the best things about pizza is its portability. You can take it with you on the bus or pack it in your bag for lunch but if you want to avoid a saucy, cheesy mess you and the pizza enthusiasts in your life will love Pizza Saver Bags . They hold two slices of the good stuff from delivery box to lunch box in a triangular shape that will keep the pizza from falling apart. This package contains a twelve pack of bags which each measure 10 inches in width and 11 inches in length and are both refrigerator and freezer safe. No more wasted slices. If the pizza kings and queens on your list have a more traditional streak and would turn up their noses at the idea of pizza scissors, then perhaps the RSVP World Class Pizza Cutter would be the perfect gift. It is made of thick, heavy weight steel which is designed for durability and balanced easy use. It’s almost 14 inches long and is dishwasher safe. Four cuts makes eight slices of pizza and you can also use it to dice herbs and toppings. If you are all out of ideas for homemade pizza or you expect that a loved one or friend may be suffering from pepperoni fatigue, you can always consult the experts in Pizza: More than 60 Recipes for Delicious Homemade Pizza . Give the gift of knowledge and improve your pizza making prowess with this fine recipe book which features more delicious recipes than you can shake a pizza paddle at. There are six different dough recipes for those discerning pizza aficionados who want to toss their own and even some recipes for working from a store bought crust. This book covers all things pizza. Sometimes you want the taste of pizza without all the effort of baking or buying an actual pie. I think we are all aware of certain very unhealthy options for “pizza” flavored chips which are loaded with artificial ingredients and preservatives but Annie’s Homegrown Organic Pizza Snack Mix Bunnies is a pizza flavored snack that is actually good for you. 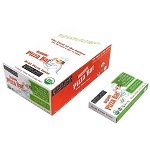 You can buy Annie’s Homegrown Organic Pizza Snack Mix Bunnies in 9 ounce 4 packs and the price per box is considerably less than at the pricy natural foods supermarkets. If you’ve ever had Annie’s snacks before, you’ll know that they’re popular with kids and adults alike. Here is another great gift idea for pizza lovers on the go or dieters who want the taste of pizza without all the carbs and calories. The fact that the Raw Food Pizza Bar is made of organic raw and sprouted ingredients makes it quite possibly the most healthy pizza “flavored” item on the planet. The Raw Food Pizza Bar is gluten free and dairy free. It contains sun dried tomatoes, olives, basil, oregano and rosemary.